Pioneers in the industry, we offer toltrazuril products from India. We are one of the well-known manufacturers, exporters, and suppliers of Toltrazuril Products. The offered toltrazuril is an effective anticoccidial which is widely used for the prevention of diseases caused by eimeria. 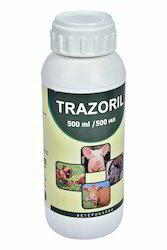 Our exported toltrazuril is effective for the treatment of all stages of coccidiosis, in animals. The supplied toltrazuril is available in plastic jerry cans, for facilitating easy transport and storage. Looking for Anticoccidial Products ?